It takes probably three or four bars into the first song, “Scorpio,” on pianist Donald Vega’s Resonance album Spiritual Nature for a magical spell to unfold. This is not the spell of an exhibitionist on a dimly-lit stage that recalls a Houdini or some Eastern Pasha; rather it is an entrancing recital by one of the most elegant and intellectually astounding pianists of today. For this is who the Nicaraguan-born, New York-based virtuoso, Donald Vega really is. Remarkably steeped in the modal tradition Vega has made the proverbial explosive entry into the scene, rejuvenating it as he does with a vortex bursting with a bubbling energy as well as the deep and joyful emotion of his own spiritual masters from Thelonious and Herbie Hancock to John Coltrane. Vega might cringe at being spoken of in the same breath as The Masters, but it is true. Listening to him, being mesmerised by the utter elegance and beauty as well as by the singularity and depth of his genius lends credence to this assumption. 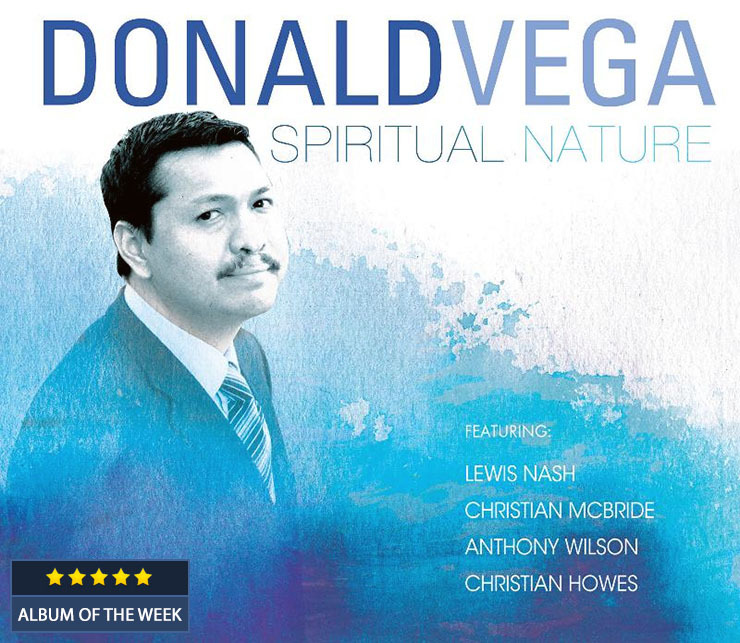 Donald Vega is one of those rare musicians with musical voice that is born in a constant state of wonder, brought to maturation almost at the moment of his musical birth like a proverbial Confucius with what seems to be ancient-modern wisdom. His technique is absolutely sublime. It would seem that his fingers are aglow with the rare nervous energy that propels them on the keys in a perpetual motion that is able to stroke the keys in such a masterly fashion that he makes each note sing gloriously; each phrase tells a beguiling story so that his soli are filled with surprising nooks and crannies. Thus his music is a constant voyage of discovery even in the most simple of melodies. Vega turns musical sentences inside out; he might begin in the middle of a phrase or approach one from an angle that is so acute that no other musician would dare reach such forbidden depths. Such a wondrous episode may be experienced throughout the unfolding of the humble offering of “Spiritual Nature”. This is a track that is deceptively simple, but as it begins, seemingly in the middle of a moving and bluish phrase, Vega hands off to the saxophonist Bob Sheppard who twists and turns the gorgeous melody in all manner of spaces before handing it over to Vega who weaves the magic that he has been blest with into a hypnotic musical tapestry. The intensity of the piece builds at his hands then softens at those of Sheppard’s saxophone which is accompanied by the colourful voicings of Bob McChesney’s trombone. These horn-men are not the only ones who keep pace with Vega’s ingenious musical plan. Violinist Christian Howes is outstanding on “River” as is guitarist Anthony Wilson on “Accompong” as he and Vega carry on a conversation at breakneck speed. But Vega’s rare artistry is best experienced on a series of tracks from “Future Child” through “Falando De Amor” to Benny Golson’s classic chart, “I Remember Clifford”. Throughout he is also held up high by the majestic playing of bassist Christian McBride and drummer Lewis Nash. The depth of Vega’s genius is something that is memorable not only for the supernatural virtuosity he displays throughout his solo sojourns, but also for the manner in with he lets his emotions out as he play. Thus Donald Vega draws his listeners in to his epic musical odyssey; one which traverses through time and space until it spins on a note that ends in an aching tribute to the master trumpeter that ends this wondrous session. Tracks: Scorpion; First Trip; River; Spiritual Nature; Accompong; Future Child; You Never Tell Me Anything; Contemplation; Etude Opus 8, #2; Falando De Amor; Child’s Play; I Remember Clifford. Personnel: Donald Vega: piano, Rhodes; Christian McBride: bass; Lewis Nash: drums; Anthony Wilson: guitar; Christian Howes: violin; Bob Sheppard: saxophone; Gilbert Castellanos: trumpet; Bob McChesney: trombone. Classically-trained in his native Nicaragua, Vega emigrated to the United States at age 14 and began learning the language of jazz from mentor Billy Higgins at The World Stage and later with bassist John Clayton at the University of Southern California. He went on to graduate from Manhattan School of Music and The Juilliard School where he studied with piano great, Kenny Barron. Vega currently performs internationally as the pianist for world renowned bassist Ron Carter’s Golden Striker Trio. Vega’s debut album, Tomorrows, was released in 2008 to rave reviews. In his sophomore album, Spiritual Nature, he is joined by the rhythm section of bassist Christian McBride and drummer Lewis Nash, where he explores the marriage of jazz, Latin and classical music. Spiritual Nature was released on the Resonance Records label August 2012. It stayed at the top of the jazz charts for several weeks, reaching all the way to #1.